I realized as I was washing dinner dishes on Wednesday that summer is starting to fade – dusk was coming a few minutes earlier. Summer can’t be over yet! I pulled out an old/retired Stampin’ Up! flip flop stamp and colored the image. And, of course, I had an 80’s musical flashback with this card! Supplies: Stamp – Stampin’ Up!, paper – Neenah Classic Crest Solar White, Stampin’ Up! Green Galore (retired), Pink Passion (retired), inks – Copic B02, RV14, YG06, VersaFine Onyx Black, dies – Spellbinders, embossing folder – Provo Craft, embossing powder – Filigree Fine Art Powder clear, twine – Webster’s Pages. Categories: card, caring, note | Tags: card, Copics, Neenah, Spellbinders, Stampin' Up!, Tsukineko, VersaFine, Webster's Pages | Permalink. The current Essentials by Ellen April Mix It Up Challenge is with Taylored Expressions. I used Taylored Expressions Build A Scene papers with Essentials by Ellen Bold Blossoms dies. The sentiment is from the Taylored Expressions Sunshiny Day stamp set. The card base is a little narrow (3.75 inches) – I was using a leftover scrap from a pieced together horizontal A6 card. Please don’t fret about the flower on the left hanging off the edge – there will be plenty of envelope space. Supplies: Stamp – Taylored Expressions, paper – Neenah Classic Crest Solar White, Stampin’ Up! Soft Sky, Taylored Expressions Build A Scene, ink – VersaFine Onyx Black, dies – Essentials by Ellen Bold Blossoms, Taylored Expressions Label It, sequins – Pretty Pink Posh Marshmallow 4mm, embossing powder – Filigree Fine Art Powder clear, twine – Webster’s Pages. Categories: card, thanks | Tags: card, Essentials by Ellen, Essentials by Ellen Challenge, Neenah, Pretty Pink Posh, Stampin' Up!, Taylored Expressions, Tsukineko, VersaFine, Webster's Pages | Permalink. 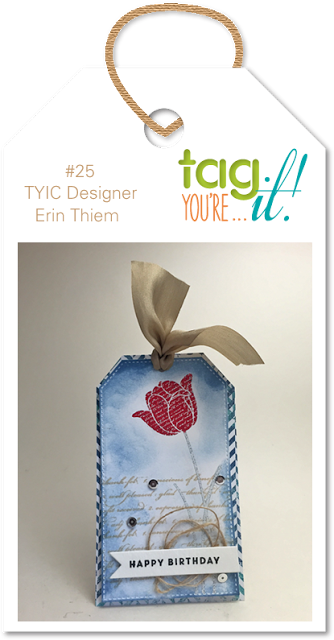 The latest Tag You’re It Challenge (#25) caught my eye. I kept some of the elements (flower, edge stripes, greeting banner, ink blending), and added new elements (dry embossing, watercoloring). And mounted it onto a top fold card. The white tag front and the green layer are both embossed with the same embossing folder. I watercolored along the embossing on the white tag with green ink to make it my flower stem. Supplies: Stamps – Papertrey Ink, Stampin’ Up!, paper – Neenah Classic Craft Solar White, Recollections chevron, Stampin’ Up! 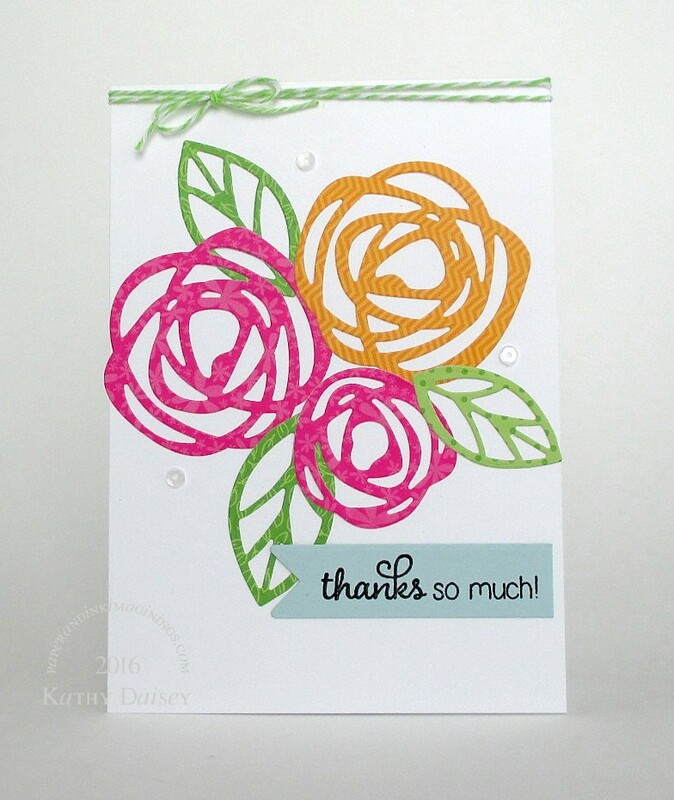 Calypso Coral (retired), Pear Pizzazz, Webster’s Pages/Allison Kreft, inks – Stampin’ Up! Pear Pizzazz, Tim Holtz/Ranger Salty Ocean, VersaFine Onyx Black, embossing folder – Provo Craft, dies – Stampin’ Up! (flower), Taylored Expressions (banner), corner punch – Stampin’ Up!, embossing powder – Filigree Fine Art Powder clear, grosgrain ribbon – Stampin’ Up! (retired), silver thread – Coats. 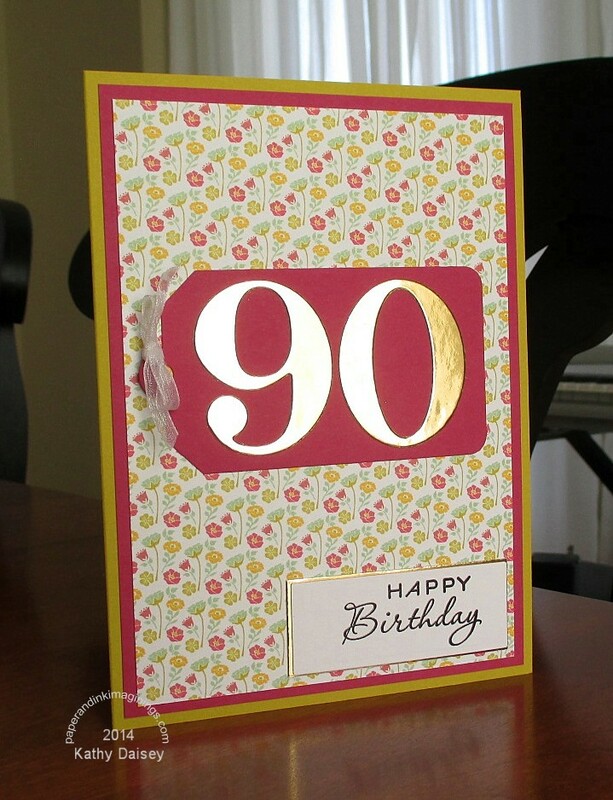 Categories: birthday, card | Tags: card, Coats, Neenah, Papertrey Ink, Provo Craft, Recollections, Stampin' Up!, Tag You're It! Challenge, Tim Holtz, Webster's Pages | Permalink. I found this bright strip of zinnias in my scrap folder recently. The black stamping is embossed with clear embossing powder. Supplies: Stamps – A Muse Artstamps, Stampin’ Up!, paper – Papertrey Ink White, Stampin’ Up! 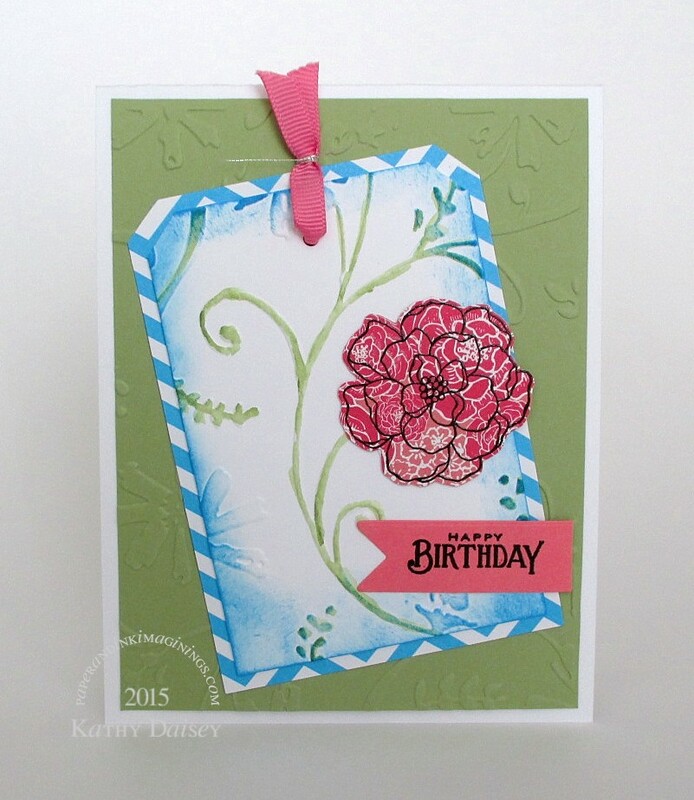 Whisper White, inks – Stampin’ Up! Green Galore (retired), Only Orange (retired), Pink Passion (retired), Tempting Turquoise, VersaFine Onyx Black, embossing powder – Filigree Fine Art Powder clear, twine – Webster’s Pages. Categories: card, thanks | Tags: A Muse Artstamps, card, Papertrey Ink, Stampin' Up!, Webster's Pages | Permalink. 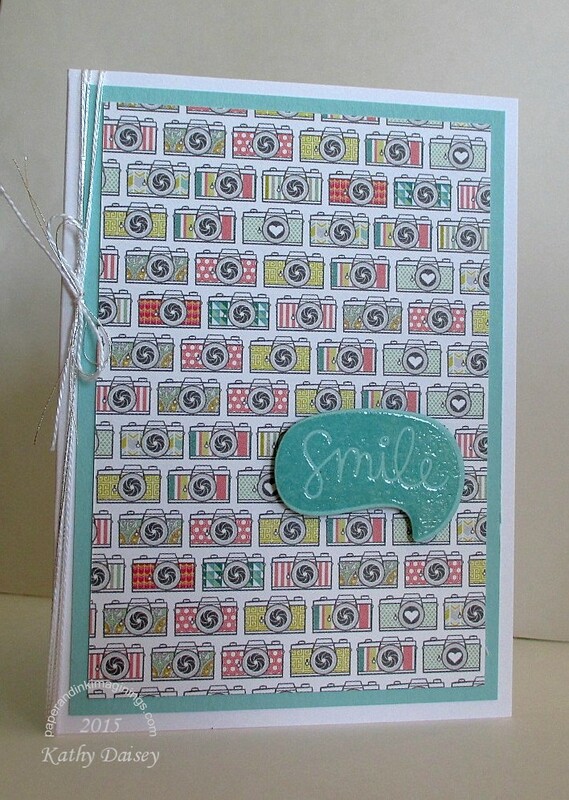 I have used this camera paper for at least one other “Smile” card…it just seems like a natural combination to me! This time, I used a speech bubble (stamped in VersaMark, embossed with clear powder) from the Lawn Fawn Into the Woods stamp set. Supplies: Stamp – Lawn Fawn, paper – Papertrey Ink White, Stampin’ Up! Pool Party, ink – VersaMark, die – Lawn Fawn, embossing powder – Filigree Fine Art Powder clear, floss – DMC, silver thread – Coats Metallic. 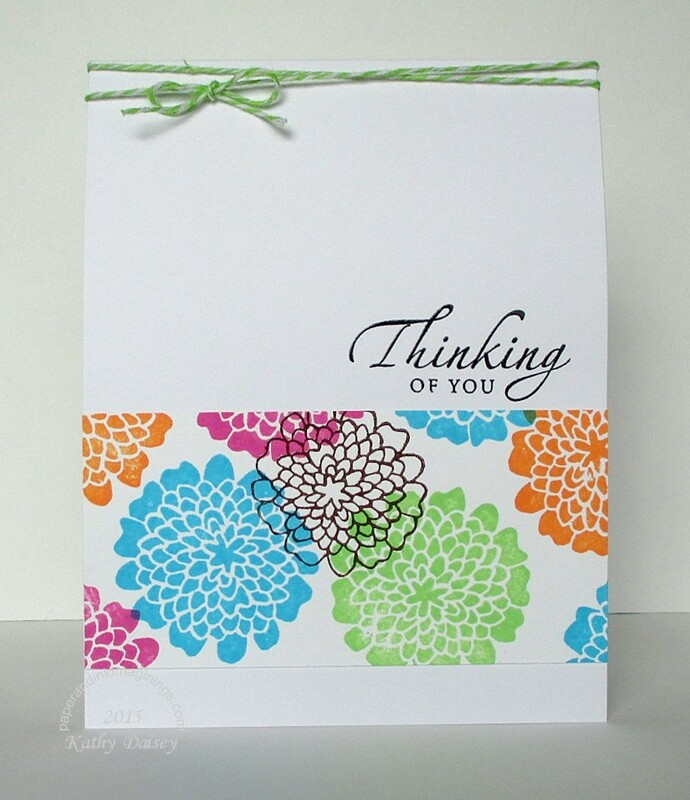 Categories: card, encouragement | Tags: card, Lawn Fawn, Papertrey Ink, Stampin' Up!, Webster's Pages | Permalink. Trying to get back “into routine” after the holidays, and I am struggling. I expected to sit down at the craft table, and have multitudes of creative ideas flow out. Just not happening. I’ve seen so many cute Valentine themed items go by on other blogs…I am not even interested in work on Valentine’s Day items yet. 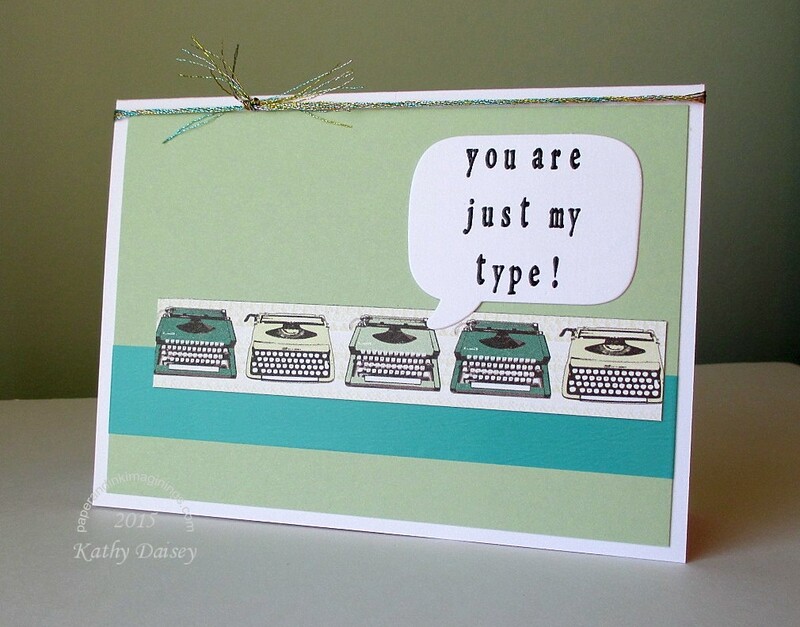 I’ve had this paper strip of typewriters sitting on my work space for 3 days, trying to work it onto a card. I decided to NOT make a Valentine out of it. Supplies: Stamps – Just Rite, paper – Papertrey Ink White, Stampin’ Up! Pistachio Pudding, Allison Kreft/Webster’s Pages, ink – VersaFine Onyx Black, die – Lawn Fawn, tape – Scotch Expressions, embossing powder – Filigree Fine Art Powder clear, metallic floss – DMC. Categories: card, caring, encouragement, I love you, note | Tags: card, DMC, JustRite, Papertrey Ink, Stampin' Up!, Webster's Pages | Permalink. We have a female family member turning 90 this month. The paper reminded me of vintage fabric or wallpaper, I am thinking she will like the floral print. The numbers are cut out of mirror finish gold metallic paper – really difficult to photograph! Supplies: Stamp – Papertrey Ink, paper – Allison Kreft/Webster’s Pages, Papertrey Ink White, Recollections Metallic Gold, Stampin’ Up! Rose Red, Summer Starfruit (retired), ink – VersaFine Onyx Black, dies – Lawn Fawn (tag), Papertrey Ink (numbers), Spellbinders (rectangle), embossing powder – Ranger Super Fine Detail Powder clear, organdy ribbon – JoAnn’s. Categories: birthday, card | Tags: card, Lawn Fawn, Papertrey Ink, Ranger, Spellbinders, Stampin' Up!, Webster's Pages | Permalink.